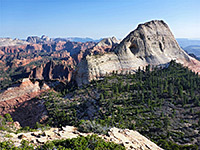 Kolob Terrace Road, also known as Kolob Reservoir Road, is the least travelled of the main roads through Zion National Park, and provides an easy way to quickly reach the wilderness and escape the crowds that can affect the more well known areas. It offers great views of distant cliffs and valleys, hiking trails to high overlooks and along narrow canyons, and varied landscapes reflecting the wide elevation range of 3,550 to 7,890 feet. 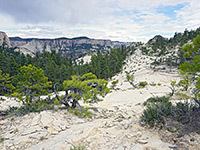 The road passes close to Lava Point, the highest summit in the park except for two peaks in the far northwest region, and affords exceptional, near 360° views of the whole park. The road, not obviously signposted, begins at the small town of Virgin on UT 9, 22 miles before the main south entrance to the park and follows North Creek, another tributary of the Virgin River. The start of the route is along a lush valley with plenty of green woodland and well-watered farm pasture, quite a contrast to the faded reddish cliffs at either side, then after a drive of 10 minutes the road begins to climb quite steeply and at one point traverses a narrow ridge with good views all around. There is a fine area for camping on the southeast side of the road shortly before the National Park Boundary - a rough network of sandy tracks winding between trees and cacti, offering many sheltered stopping places. There is no entrance station to the park, just an NPS sign, but 1.75 miles inside the boundary, a lay-by on the east side marks the starting point for one of the most famous trails in Zions - the route along the Left Fork of North Creek, also known as Great West Canyon. This flows through a wild canyon that becomes more narrow and scenic upstream, culminating in 'The Subway', where the creek becomes enclosed in a circular passage, almost like a tunnel. The Kolob Reservoir Road passes outside the park again for a while, crossing the Lower Kolob Plateau which is used for cattle grazing and horse meetings, and indeed much of the traffic to this point is for livestock transportation. The road re-enters Zion National Park following a sharp turn east and ascends even more steeply, through alternating meadows and woodland, all very pretty and with frequent glimpses of remote mountains and canyons. A few miles back inside the park, after passing a pair of ancient cinder cones on either side (Firepit Knoll and Spendlove Knoll), the road crosses Pine Spring Wash, which upstream flows over open land for a while then emerges from the end of a narrow canyon. There is no trail here but it is easy enough to walk beside the creekbed, across slickrock slopes then into the canyon, which is not quite a slot though respectably deep and enclosed. Past the wash, and after another steep ascent, the road becomes narrower and flattens out at around 7,000 feet, by which point the landscape is very different from the desert-like conditions of the Virgin River valley at the start - thick pine forests with wide clearings and shallow ponds, fed by melting snow which may not clear completely until June. 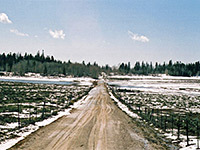 A gravel side road beside Blue Springs Reservoir follows a forested ridge formed by an ancient lava flow and ends at 7,890 foot Lava Point. All of the park to the north, east and south is spread out beneath, and the huge domes of Zion Canyon itself are clearly visible, 10 miles away to the southeast. 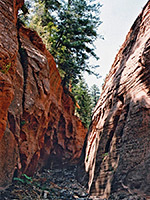 Shortly before the point, a rougher track leads to the Wildcat Trailhead from which various cross country routes begin, including the hike to the deep and watery slot canyon of Kolob Creek. Beyond the Lava Point turn-off, the land becomes relatively well developed, with many ranches, houses and log cabins dotted amongst the fir trees, many used only as summer homes. 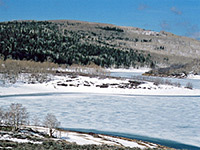 These continue about as far as Kolob Reservoir, at 8,118 feet, where the road is now unpaved, yet continues for many miles through the upper Kolob Plateau, eventually meeting other routes that lead towards Cedar City. The reservoir has many good places for camping right at the waters edge, and is also good for fishing. 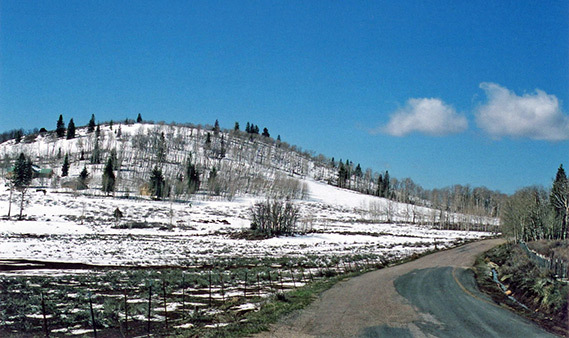 It is especially scenic in winter, when frozen and surrounded by snow covered slopes and forests of aspen.